Our educational travel programmes are specifically designed around the areas of interest of the educational institution working with us for their travel here in Ghana. Most importantly we listen to and work with the schools, universities and colleges looking to travel with us, ensuring we meet all their expectations during their time here. We encourage learning through safe exploration and active participation, as we focus on engaging students, challenging them to think critically, whilst making them active learners. Personal development, intellectual growth and relationship-building in an enjoyable and safe environment are the key areas of our successful educational trips. Challenging and engaging students helps them to develop social skills and new learning techniques, which will benefit them throughout their life. Our expert team of tour directors and planners is ready to work with you in designing and organising dynamic, constructive and inclusive study groups around your areas of interest. One of the benefits of choosing Ashanti African Tours for your educational student travel to Ghana is our ability to design and lead tours in a multitude of different areas of interest. Employing over 25 local experts on a full-time-basis enables us to ensure the high quality of our travel programmes. We are experts in a wide range of areas, from History to Butterflies and Birds to Culture and we can offer a varied portfolio of educational tours. Our experienced tour planners are ready to work with you in designing and organising that perfect educational student trip, just contact us. A total Ghana experience, immersing groups into our diverse culture and traditions, whilst learning about Ghana’s historical past. Flora and fauna are on our agenda as we learn about and experience Ghana’s incredible biodiversity, with exceptional wildlife encounters. 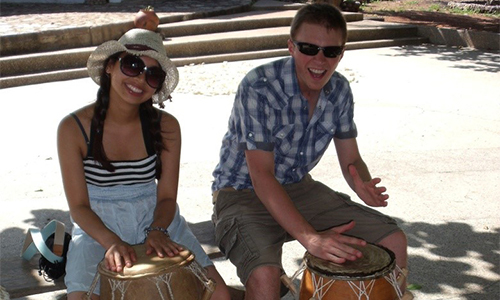 Fun-filled challenges, exposing students to African drumming, traditional dance, arts, crafts and local cuisine offer wonderful learning experiences outside of the classroom. 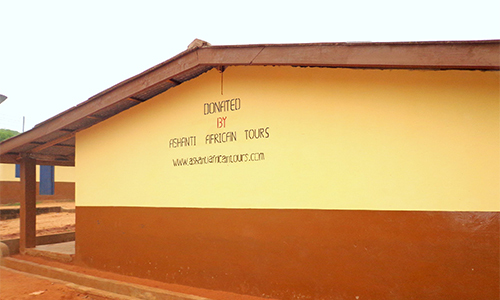 Connecting with local schools here in Ghana is also an option as we have built two schools to date through our ethical travel initiatives; just contact us and we can design that perfect trip. Sport is a vitally important part of any young person’s development and Ashanti African Tours are leaders in educational sports packages here in Ghana. 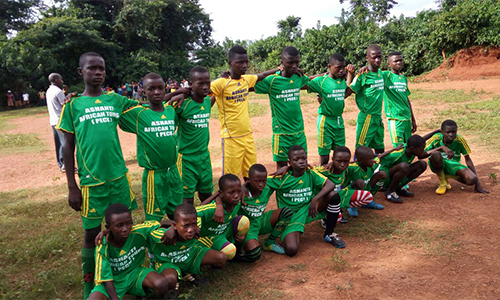 Two local football teams for both boys and girls are sponsored by us here in Ghana; one in a coastal community near Elmina, and the other in the Ashanti Region. Our educational sports programmes range from rugby, to athletics, basketball, football, baseball, volleyball, netball, cricket, cycling, table tennis and tennis. Sport has an amazing ability to bring people from different cultures and backgrounds closer together. Allow our team to design that perfect package for you. To see detailed information on our current school project where we are building an eleven-classroom school facility in the Ashanti Region and also protecting endangered bird and mammal species and an area of rainforest, please click on the PECK Info link. Rest assured that when booking with Ashanti African Tours, you are booking with a professional, legitimate company operating with all the necessary insurance policies, licenses and registrations. Our Ghana Tourism Authority operating license number is T-04/CR/16; our company has public liability and professional indemnity insurance with a policy cover of $1,000,000.00 per claim; all our vehicles are comprehensively insured and all our guides are registered and certificated to guide tourists. All of the above are legal requirements to accept international and domestic volunteers and tourists here in Ghana. We understand the importance of safety, especially when working with volunteers and this is our main priority when operating programmes. When travelling to Ghana, it is important to book with a local tour company that has the legally-required insurance policies and operating licences, as your international travel insurance will be invalid if they haven’t. Ghana is an emerging economy and the resources are not available to check and identify the many bogus travel companies which have developed websites and operate illegally here. The cheapest option is not always the best option, as there are reasons for companies offering cheaper packages and these are usually due to them not operating within the laws of the land. It is estimated that over half of local tour operators offering placements here in Ghana do not have professional indemnity and public liability insurance; use vehicles that are not comprehensively insured; do not have a Ghana Tourism Authority operating license and as they are not registered, do not pay taxes which ultimately has a negative effect on Ghana’s development and ability to direct funds into the very areas you have come to volunteer in.